We are constantly expanding our curtain and upholstery fabrics range. We already have plenty of quality designer fabrics available for linen curtains and cotton curtains. However since there is an increasing demand for organic curtains fabrics we have decided to launch a new organic curtain fabrics range. Our goal is to provide the finest fabrics plus Sewing services to fit your needs. Our extensive range of designer upholstery, loose covers and curtain fabrics include great designer fabric in the following qualities: 100% Linen Fabrics, Linen Cotton Fabric, Cotton Fabric, Floral Fabrics, Striped Fabrics, Checked Fabrics and Various linen sheer fabrics. The designer curtain and upholstery fabrics have been arranged on the Ada&Ina’s website in several ways. We have arranged them so that you can either choose only whites and naturals for example. Or you can choose only the fabrics which are suitable for upholstery or loose covers. Please note that our upholstery fabrics are not fire retardant so they have to be made with fire retardant interlining or get treated. We can recommend you a company which can treat your upholstery fabric for you. They are also able to treat any of our curtain fabrics for trade clients so the fabrics can be used in curtains for commercial premises and other commercial projects. We even have a section for patterned fabrics – at the moment we have some lovely simple and timeless stripes, checked and woven floral patterns in our designer fabric collection. They all work very well with all of our fabrics – so you can mix and match them to suit your own personal taste. You can be your own designer and create your own designer range to compliment your home decoration. We have sourced our fabrics from the best European fabrics which are often used by designer fabrics houses. Since we buy the fabrics directly from the factories we can offer you very competitive prices without compromising the quality. We always recommend for our clients ordering samples before placing an order. This way you can make sure that the colour and feel of the fabric is right for your home. We are ensured that once you have received our samples you will see that the quality of the fabrics is as outstanding as that of the more expensive designer curtain fabrics. We are happy to work out curtain or upholstery fabric quantities and we also have a curtain and roman blind making service. 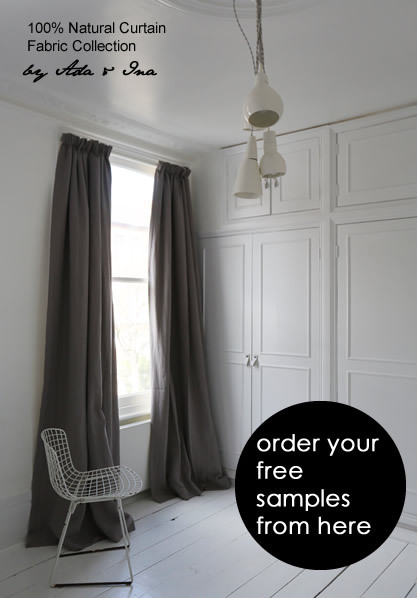 You can calculate made to measure curtain and blind making prices on our website. Why not test our sample service now so that you can see and feel that there is no difference between our fabrics and the more expensive fabrics.